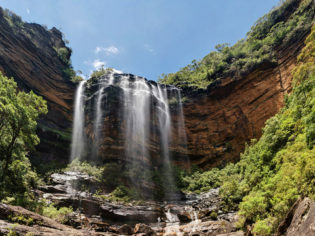 Small village towns perched high above sea level, an abundance of waterfalls and swimming holes, boutique shopping and connoisseur coffee – the Blue Mountains region has something for everybody. But next time you go, your visit can include more than the Three Sisters and Scenic Railway, with this local guide to the Blue Mountains in your arsenal. With a diverse range of ragged terrain, the Blue Mountains region hosts an extensive amount of valleys, gullies, peaks and ridges. With these come incredible spots to trek to for a swim, some native animal spotting or plenty of chances for a great photo op. 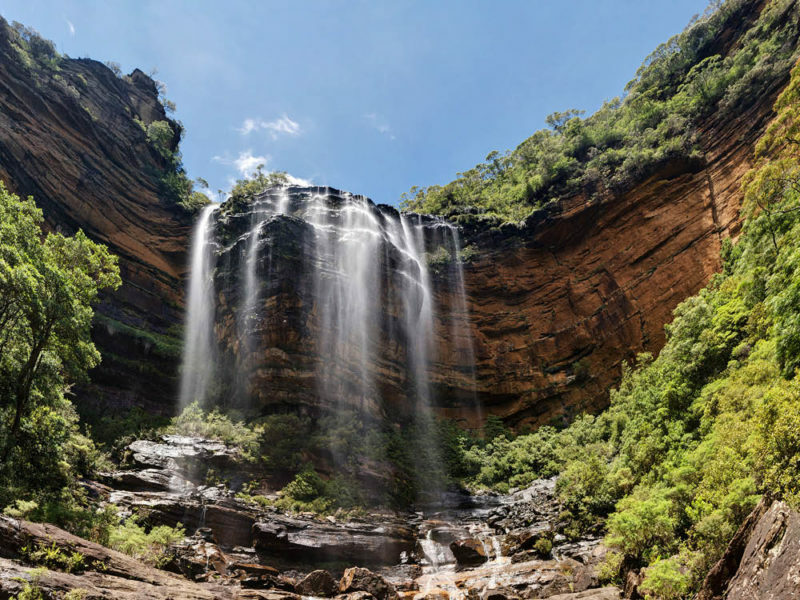 One of the most popular waterfalls in the Blue Mountains, Empress Falls, sits at the base of Conservation Hut in Wentworth Falls. It is an extremely steep descent into the valley but the view is worth it, as you seat yourself below the giant waterfall. With a one-hour round trip, this is one of the Mountains’ most popular and scenic treks. But be sure to come prepared with food and water, you will need a rest at the base before the steep trip back to Conservation Hut. If you’re looking for a lesser-known spot to pack a picnic lunch then Minnehaha Falls, a waterfall situated in North Katoomba, and Terrace Falls, off Terrace Falls Road in Hazelbrook, are perfect. With an easy to medium difficulty and very little foot traffic, these swimming spots are where the locals go. An approximately 50-minute drive from Katoomba, Bilpin is a tiny hamlet renowned for its fruit picking (and cider). The Bilpin Fruit Bowl opens its farm on weekends, and during harvest time you can go and pick seasonal fruit straight from the source. Fruits include nectarines, peaches and apples of many varieties. Whilst visiting Bilpin, visitors should pack a picnic lunch and head to Mount Tomah, only 15 kilometres from Bilpin centre. Mount Tomah is known as the Blue Mountains Botanic Garden, and home to an exquisite array of mature plants that are a nature lover’s dream. Coffee and creativity are woven into the fabric of the Blue Mountains. To make the most of your trip, be it summer, winter or in between, it is important you find a local cafe and soak in the ambience. Trendy and eccentric, the Red Door has some of the best coffee in the Mountains, as well as the best lunch options. Great coffee, with a fireplace and relaxing atmosphere, this is the best spot to get creative. Best cappuccino in the Blue Mountains, and a built-in chocolate shop – what more could you ask for? All about health, Dbl has not only great coffee, but virtuous food options to enjoy on the side. And if you are strapped for a book, head to the Turning Page Bookshop in Springwood or Megalong Books in Leura for your fix. Because who doesn’t like curling up with a good book? The great Aussie pie-tasting quest will never truly be satisfied until you stop at Mountain High Pies. With beef, cheese and bacon; lamb and rosemary; and the big breakfast pie on the menu, this is one of the best pie shops in Greater Sydney. All pies are made daily on site, and the owner Damian is always up for a chat as he makes you a coffee. It’s no secret that the Blue Mountains are a rich source of Indigenous culture, history and sacred sites. These sites include Glenbrook’s Red Hands Cave which hosts a collection of hand paintings on sandstone that were meant to represent the ‘Bora’, the transition of boys to men. Centuries-old, these hand prints represent the importance of the Blue Mountains to Indigenous people. Along the same walking track you can see the carving site for hunting tools, with grooves still in the stone. This walk takes approximately 1.5 to two hours. Another significant site, the Waradah centre in Katoomba, is a cultural centre that holds daily performances to teach visitors, and locals, about the tribes native to the Blue Mountains. To represent the winter solstice, people flood to the main street of Katoomba in costume, ready to dance and sing. Stalls line the street, selling quirky, home made goods or food and coffee. Next on: 22 June 2019. Situated in the beautiful Everglades Garden, the Shakespeare festival turns Leura into a beautiful outdoor theatre ready to celebrate the works of the great man himself. On now until 27 January 2019. This festival, also held in Katoomba, is a celebration of all things 1950s. Fashion, swing dancing, vintage cars. You’ll see ladies dressed to the nines and men in suspenders. This festival is hosted at the famous Carrington Hotel, but spans the main street with stalls and musical performances. Next on: 19 January 2019. This old-fashioned gem of a cinema, with its worn red chairs and velvet curtains, takes you back in time. Initially the School of Arts during the early 20th century, the former auditorium has been converted into an independent cinema, where you can see all the new releases for $11.50 with a choc top and popcorn to boot. One of the best things to do in the Blue Mountains, even for the locals, is to shop. Be it rare book and antique shopping at Mr Pickwick’s in Katoomba or boutique shopping in Leura Mall – find homewares at Maison Montage and fashion and footwear at Trumps (Spanish shoes? yes please!). For the ultimate shopping experience, head to Lyttleton Stores at Lawson. This historic collection of buildings, established in 1884, has morphed into a sustainable living nook, with organic produce grown on site as well as a range of locally sourced items, including art and pottery. Lyttleton also run workshops for sustainable living, including indigo dyeing and cheese making workshops. There is shopping in the Mountains for everyone, with a strong mantra of ‘shop local’ embedded throughout. 150-metre walk from Olympian Parade off Leura Mall, this is one of the most beautiful lookouts, with views of Sublime Point to the left and the back-side of the Three Sisters to the right. Off Tablelands road, this is a local hang out, and the perfect picnic dinner spot and great for photo opportunities, especially at sunrise or sunset. As the name suggests, this lookout has views to the Narrow Neck peninsula, with sweeping views of the valleys below. If you time it right, you can see the silhouette of trees as the sun sets over the mountains in the distance. Top tip: grab a pizza from Papadino’s in town and eat it with a plus one as you watch the sun set.